Lands were measured in Tamilnadu by using a rod or pole called kol as revealed by epigraphical records. This kol was generally based on either human span (chan) or foot (adi). A kol was named according to the number of spans or feet it comprised, for example, 16 - span rod, 12 - adi kol and the like. It is interesting to note that only the adi kols are mentioned in the epigraphical records of Thiruchirappalli district and so far not a single span kind of rod was met. 12 adi kol is the commonest and was used in Alambakkam, Thiruerumbiyur and Thiruppainnili. It is also understood from the records that some of these rods had special names such as the Srirangam rod which is mentioned in a Chola record as kadamai irukkum kol. Apart from being mentioned in the inscriptions some of these measures are marked on the temple walls as the interval shown between two plus marks. Occasionally a third mark is also noted. During our field studies in the past thirty years, good number of such land measures along with sculptor’s scales were discovered from several temples of Tamilnadu. This article highlights the discoveries that belong to the period 500 -1300 C. E and found in the temples of Thiruchirappalli district. Most of our finds are named with an engraving in between the plus marks or nearby. The commonly noted names denoted the type of land for which the measure was used (nan cey kol (measure for wet land), pun cey kol (measure for dry land). Some of the rods were named after the unit of land that was measured (kulik kol). Some had general names (alavu kol, nilam alanta kol, manaik kol). A few which had special names such as sivan ennum palankol, maligaik kol, kukaik kol and periya tirugopurattu kilaik kol are mentioned in the inscriptions copied by us. Measuring rods named after the villages in which they were used such as thiruvanaikka nancey alavukol were also in existence. 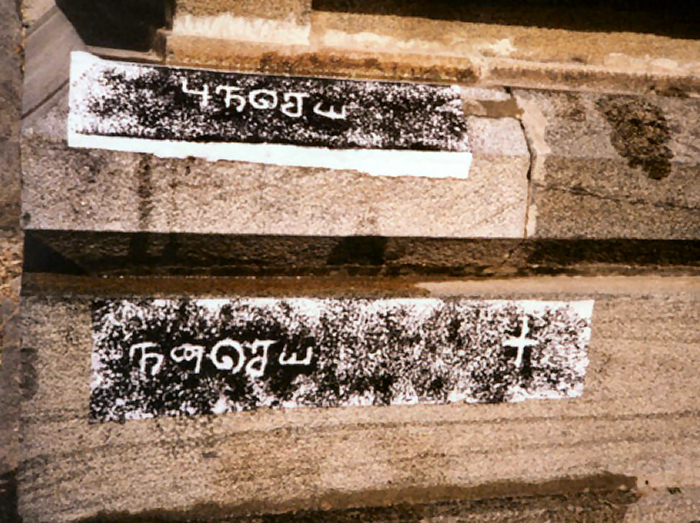 A land measuring kol discovered on the vimana of Kasivisvanatha swami temple at Srinivasanallur is represented by the distance between two plus marks and its exact measure by the metric system is 3. 35 m. An inscription engraved in between the plus marks name the kol as ‘chaturvedimangalattu nilam alanta’. A partly damaged inscription from the same temple that deals with a sale of land mentions a land measure by name fourteen mula kol by which the land was measured and sold. 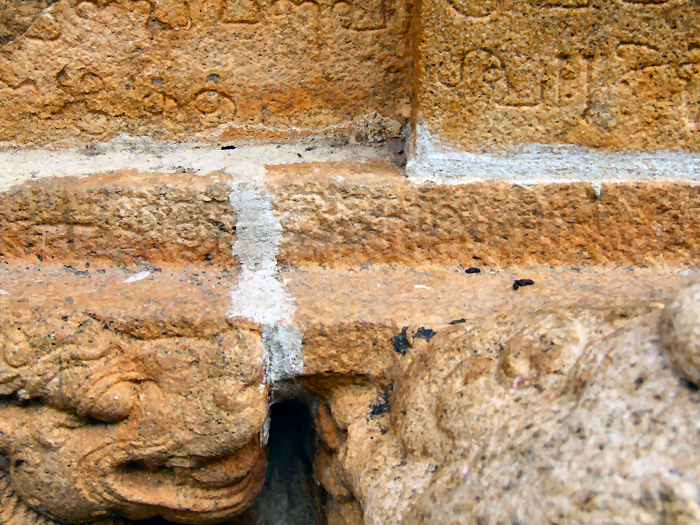 Similarly an inscription from Samavedisvarar temple at Thirumangalam mentions enmula kol, a rod of different length. Two measuring rods were discovered from the southern wall of the central shrine of Chandrasekara temple at Thiruchchendurai. Both of them have their names engraved near them. The first one found on the sanctum mentioned as kulik kol in the engraving measures 90 cm. Such a fractional measure was not found anywhere in the study area till date. The longer measuring rod mentioned as nilam alanta kol in the engraving, measures 4 m. by the metric system and is marked on the mukhamandapa. An inscription of Rajaraja I found at the Vadatirtanata temple of Andanallur, a nearby village, refers to this as ‘Thiruchchendurai Srivimanattu vettik kidakkum perun kol’ and mentions that lands were measured using this. Periyakurukkai Akaram is a small village situated near Peruvalanallur, the battle site mentioned in Kuram copper plates. Alagiya Chokka Nayanar temple of this village has constructions that belong to the period of the fag end of the Cholas. Two measuring rods with engravings ‘nan cey’ and ‘pun cey’ were discovered from the basement of the mahamandapa one on each side of its entrance. The nan cey kol marked between two plus marks measures 4.68 m. The pun cey kol measures 5. 64 m. is marked by three plus marks instead of the usual two. The distance between the first two plus marks measures 5.59 m. and the distance between the second and third marks measures just 5 cm. The reason for the presence of an extra mark is not understood. Two similar nan cey and pun cey measures were found from the temples of Thiruttiyamalai, Thiruppainnili and Thiruppattur. 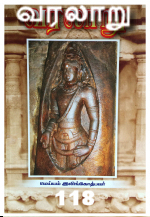 The Thiruppattur measuring rods were discovered from the mahamandapa of the Ayyanar temple. In this case the pun cey kol has two plus marks with the distance in between measuring 5.64 m. whereas the nan cey kol with similar markings measure 4.89 m., both of them have their names engraved near by. Two measures are mentioned in an inscription of later period copied from this temple, one used for wet lands measuring 27 feet and another used for dry lands measuring 30 feet. 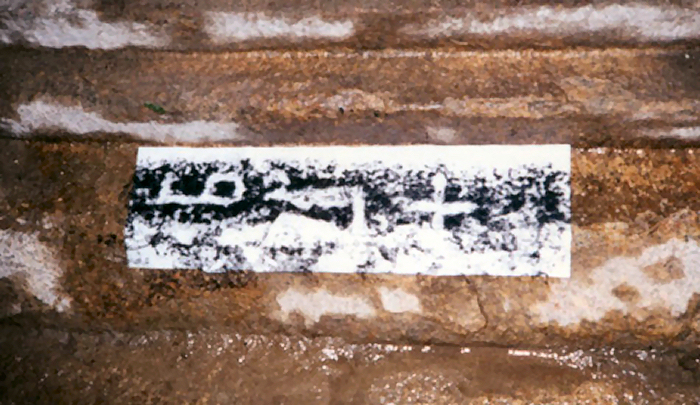 Two land measures marked between two linear marks were discovered on the southern wall of the second enclosure of Nilivananatasamy temple at Thiruppainnili with out any names engraved. The first one measures 4 m. and the second one 3 m. In the absence of any specific names it may be presumed that these two markings denote the usual nan cey and pun cey measures found elsewhere in this district. A Chola record of this place mentions a panniradik kol. Two land measuring rods with engravings nan cey and pun cey were noted at the entrance of the abandoned Siva temple at Thiruttiyamalai. The first one mentioned as nan cey kol measures 4.06 m. and the second one mentioned as pun cey kol measures 5.10 m.
An analysis of all the records copied from Saptarishisvara temple at Lalgudi revealed the names of a few land measures that were used in this area. Apart from the panniradik kol, another land measuring rod mentioned in a record of Later Chola period as sivan ennum palankol was also in use. The very word palankol used as the suffix denotes the antiquity of the usage of this measure. A marked land measuring rod was discovered near the Amman shrine of this temple and it measures 3. 47 m. between the plus marks. It is named as ‘alavu kol’ in the engraving found near by. Differences in measurements are noted between the measuring rods of one place from the other and similarities between them appear to be a rare feature. Standardization of measuring rods through out the study area during any part of the study period was not undertaken as understood from the records. But certain phrases used in the inscriptions such as, ‘tiruulagalantapati nilam’, ‘tiruulakalanta kanakkil’ suggest an attempt to standardize the land measuring rods during the Chola rule. Scholars also suggest that such attempts were made under Rajaraja I and Kulottunga I, hence the naming of certain rod measures found elsewhere as, ‘tiruulakalantapadi kol’, and ‘tiruulakalanta sripata kol’. A manaik kol discovered from the basement of the front mandapa of Kailasanather temple at Alambakkam measures 2.88 m. between the plus marks with an engraving ‘manai’. 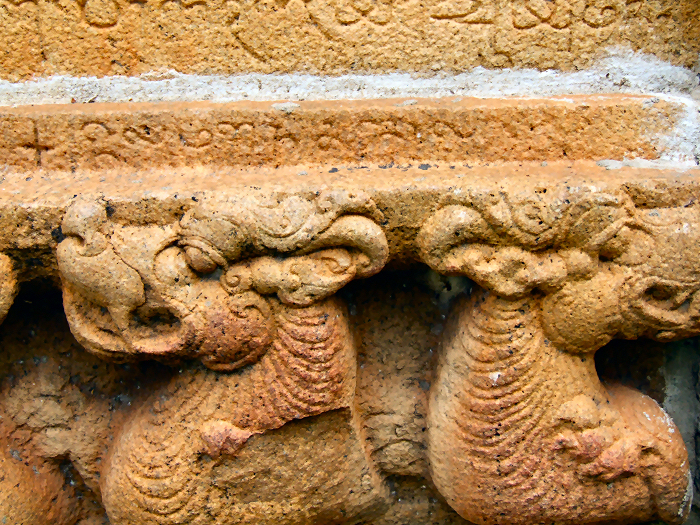 This measure meant for house sites is mentioned in the 12th regnal year inscription of Rajadhiraja II copied from this temple. As kulik kol, manaik kol is also a rarity and not found in any other temple in the study area, though mentioned in the records.